WORLDWIDE SCREENING OF THE BORNEO CASE IN CONJUNCTION WITH MALAYSIA DAY SEPTEMBER 16 2017. 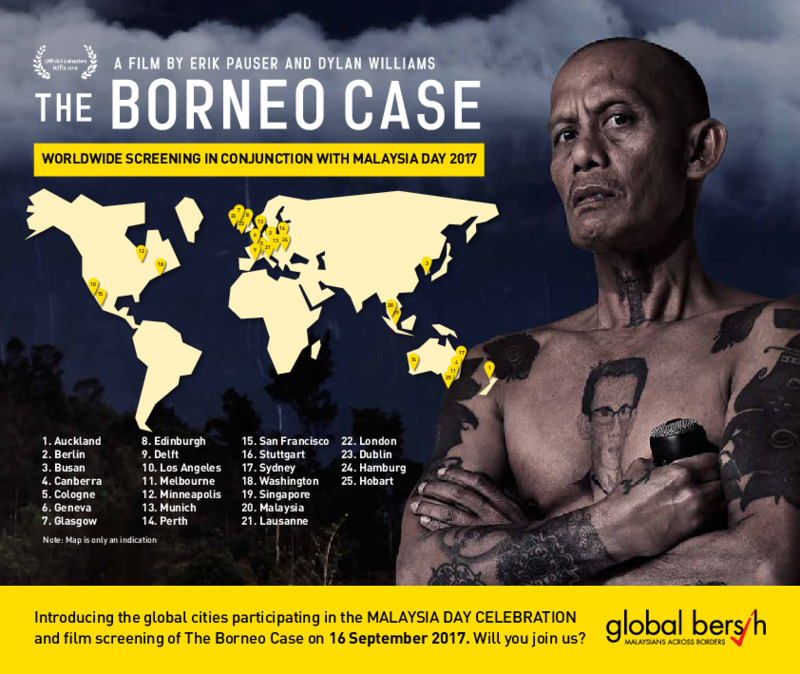 It is with great pride that we can announce that The Borneo Case in association with Global Bersih will be screened in up to 30 Cities all over the World on Saturday 16th September.Timed to coincide with Malaysia Day the film will be screened to packed audiences from Sydney to San Francisco, Stuttgart and Singapore. The film will be followed by Q&A sessions and live Skype link ups where discussion about of how profits from the illegal logging of the Malaysian Rainforest, could be moneylaundered’ into property portfolios around the world for so long. Bala Chelliah, President of Global Bersih gives an insight into the importance of this event, “The screening of The Borneo Case will be a special moment, unifying Malaysians across the world and allowing them to celebrate their countries Birthday, while also creating awareness of some of the terrible crimes being committed in their own back yard”. Fair Finance Guide report launched 7 March 2017. Swedish Premiere as part of Tempo Documentary Festival 9 and 12 March 2017. Seminar and screening at Stockholm School of Economics 10 March 2017. AMP Film are delighted to announce the following upcoming festival screenings! Docpoint, Helsinki 26th, 28th and 29th January 2017. 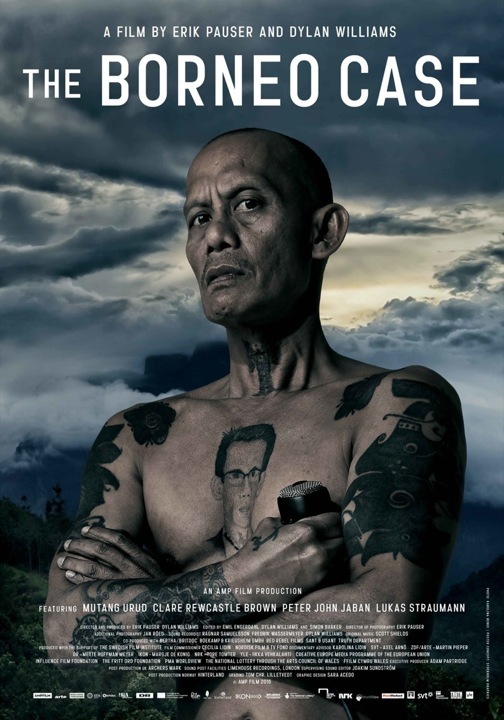 THE BORNEO CASE | at IDFA Documentary Festival 16-27 November. Location: IDFA Documentary Festival 16-27 November. We are delighted to announce that the film will receive its International Premiere as part of the Masters section at the prestigious IDFA Documentary Festival 16-27 November. Many Thanks to the innumerable people who have all contributed and helped bring this urgent story to fruition. Thank you all! Erik and Dylan and the rest of the team behind the film. THE BORNEO CASE | Premiere as the Opening Film at the Freedom Film Festival, August 20, 2016. Location: Freedrom Film Festival, Kuala Limpur, Malaysia. The Borneo Case will premiere as the Opening Film at the Freedom Film Festival in Kuala Lumpur, Malaysia, August 20, 2016. The film’s release in Malaysia has been unclear until the very last minute because of the film’s controversial content. The film will premiere in Europé in the Autumn of 2016. This film starts in Montreal where former activist Mutang Urud lives in exile. After enduring torture and imprisonment for his role in attempting to stop the illegal logging of his people’s lands, the Kelabit tribesman was forced to flee more than 20 years ago. However when he hears a podcast from an illegal radio station – Radio Free Sarawak – of plans to build 12 New Hydropower Dams – one of which will completely drown the valley of his birth, He is compelled to travel home. Simultaneously, from its secret location in London, the journalists of the Radio Station, Clare Rewcastle, and DJ Peter Jaban seek to investigate what has happened to the billions of dollars of profits from the illegal logging. When Mutang witnesses the destruction on the ground he is drawn back into the fold and together with the efforts of Clare and Peter we follow them on an international money trail that sets them against the political elite of Malaysia. As they seek to unravel the network of global money laundering at the heart of the logging industry members of the political elite who have benefitted from logging come into their sights and the story takes an unexpected turn as the fallout from their findings begins to have major consequences. As a result of the investigation launched by the characters in the film over 600.000 people took to the streets of Kuala Lumpur in protest at high level corruption, whilst the Borneo State leader Abdul Taib Mahmud unexpectedly announced his resignation after 33 years in power. After the completion of the film the ongoing investigation into corruption has continued and led the US Department of Justice to launch lawsuits to recover more than $1.3bn of stolen assets that had been funneled through the American financial system. In the press conference announcing the lawsuits US Attorney General, Loretta Lynch, called it “the largest kleptocracy case” in US history. The film is produced by AMP film and co-produced with Boekamp & Kriegsheim, Red Rebel Films, Sant & Usant, Truth Department with the support of SVT, SFI, DR2, DFI, NRK, NFTVF, IKON, Creative Europe – MEDIA Programme of the European Union, ZDF-Arte, Influence Film Foundation, Fritt Ord, BERTHA/Britdoc, Film Cymru Wales, PMA World view. AMP film hälsar dig välkommen till förhandsvisning av Filmen Storyboard P – A Stranger in Sweden på Bio Rio tisdagen den 14 juni 19:30. Insläpp19.00. Live performance av Storyboard P och kompositören Douglas Dare i anslutning till filmvisningen. När streetdansaren Storyboard P smidigt glider genom snön skär han precisa former med sin smala kropp. Trots att han har bott på gatan i Stockholm ett tag är han fortfarande full av självförtroende. “Min vision är att ta dansen till högsta konstnivå” säger han. Några månader innan bjöd 19-åriga Joanna in Storyboard från Brooklyn till Sverige för att hjälpa till att sprida dans stilen som han kallar ”Mutation”. Men kulturkrocken som följde blev större än någon kunde ana och hans drömmar om succé verkar nu ligga långt ifrån verkligheten. Ska den begåvade dansaren äntligen få sin chans i Europa? Regissören Matthew D’Arcy skildrar Storyboards första steg mot international berömmelse som lett till att The New Yorker kallar honom “The Basquiat of Streetdance”. Birgitta Karlström Dorph var under 1980-talet svensk diplomat i Sydafrika – men också Sveriges hemliga agent. Hon är fembarnsmamman som kom att överföra omkring en miljard kronor till det förbjudna apartheidmotståndet. Verksamheten var hemlig – även i Sverige. Den diskuterades aldrig i riksdagen. Nu är Birgitta redo att berätta om en omvälvande tid i svensk nutidshistoria. A few years ago Johan Jönson wrote the acclaimed book ‘Efter arbetsschema’. A 800-page tomb of poetic confession, diary and contemporary reflection. Since then, he has written two poetry books, both of which were over 1000 pages each, and has been called one of Sweden’s most important working-class poets. Johan Jonson writes extremely frankly about himself as well about the people he meets. Jönson does not hold back from communicating thoughts of violence and self-loathing that pass through his brain. He has been described as having ‘a twisted and brutal sense of humor’. Johan Jönson won Aftonbladet’s Literature Prize in 2008 and was nominated for the Nordic Council Literature Prize in 2009. His subsequent book ‘Livsdikt'(2010) received considerable attention and was nominated for the prestigious August Prize. In January 2012, he published his latest book – the 1200 pages long ‘med.bort.in’. Premiere SVT K-Special 6 dec 2013. The Machine will be shown at Litteraturhuset Göteborg 12 nov.
(Swedish title Vi som älskade), Prix Italia and Prix Europa nominee. The film has already picked up 5 awards (SVT Ikaros Price for best SVT Documentary, Best film at Vera Festival, Best Documentary at Art Doc Fest in Moscow, Best film at Pärnu International Film Festival and a honorable mention at Tarkovsky Film Festival in Ivanovo). We are proud to tell that we are presented at Prix Italia and Prix Europa. PRIX EUROPA has selected ONCE THERE WAS LOVE from 199 European media productions to compete for the prestigious Best European Television of the Year Award 2013. A total of 664 high quality productions from 36 countries had been entered- which made for a tough preselection. Det är med glädje som vi kan meddela att Amp Film är nominerade med dokumentären Vi som älskade i kategorin bästa tv dokumentär på Prix Italia och Prix Europa. (Swedish title Smittad), our new film for Swedish television will premiere at SVT 1 October 29 at 9 pm. As the HIV epidemic spread around the world in the early 1980′s panic broke out. In Sweden alone newspapers predicted that over a million people would die before the year 2000. HIV patients were often kept under lock and key as authorities struggled to know what to do and the public in general believed anything they heard. Using unique and often very telling archive material, this film will weave the compelling and emotive stories of people whose lives were changed forever by the ‘virus from hell’. As we look into the not so distant past and observe the reflex actions of our society when under threat, this film asks what we have learnt from our experience and whether it will allow us to deal with the next crisis differently? Svensk dokumentär från 2012. Sverige på 80-talet. Yuppien hade sett dagens ljus, vi bar axelvaddar och tränade aerobics. Gayrörelsen var på frammarsch och utelivet hade börjat blomstra. Men det mullrade i bakgrunden. Ett dittills okänt dödligt virus spreds bland homosexuella män och läkarvetenskapen stod handfallen. I dokumentären varvas unikt arkivmaterial med röster från de som var med under den första tiden när hiv kom till Sverige.